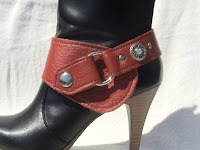 Boot season is offically in gear, and my quick search today on Etsy yielded these unique, creative boot options. 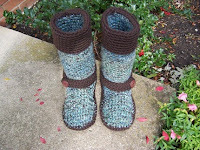 Treat your feet to handmade cozy sweater boots, enhance a plain pair boots or winterize (bootify?) your strappy sandals with splendid creations like these from Etsy. A fashion lesson from the women of Paris is to buy just a few, great fitting, good quality basics for your wardrobe, and accessorize with scarves, belts, jewelry, shoes and boots to change your look. 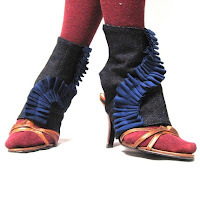 I've always thought of boots and shoes as accessories in themselves, but today's virtual stroll through the Etsy marketplace inspires me to accessorize footwear that I already own, thereby saving some money and having some fun. Click on the pictures to go directly to these Etsy listings. Prices range from $24.50 to $125.00. 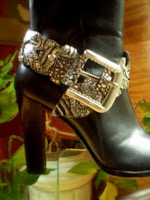 I've thought for years that dressing up your boots, no matter how new or old they are, with chains, beads or leather, will elevate a persons individuality. Thanks so much for including my red spatz to your awesome feature. And Anne: Ditto! Every leather color you make is great! 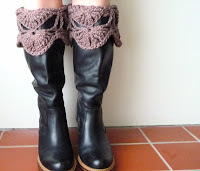 I also love the warm brown which is a great way to make the black boots work when the outfit calls for brown. Love this blog and I'll have to link it out to everyone - you have the most unique and exotic things featured! 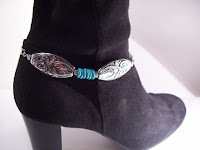 Appreciate being included with my boot double concho bracelet! What a fun post! Lots of great ideas. Great finds! Lovin' those red spatz!! !